If your nails are in need of a little TLC but a salon manicure is not in your future, this DIY nail soak will perk your nails up in no time! 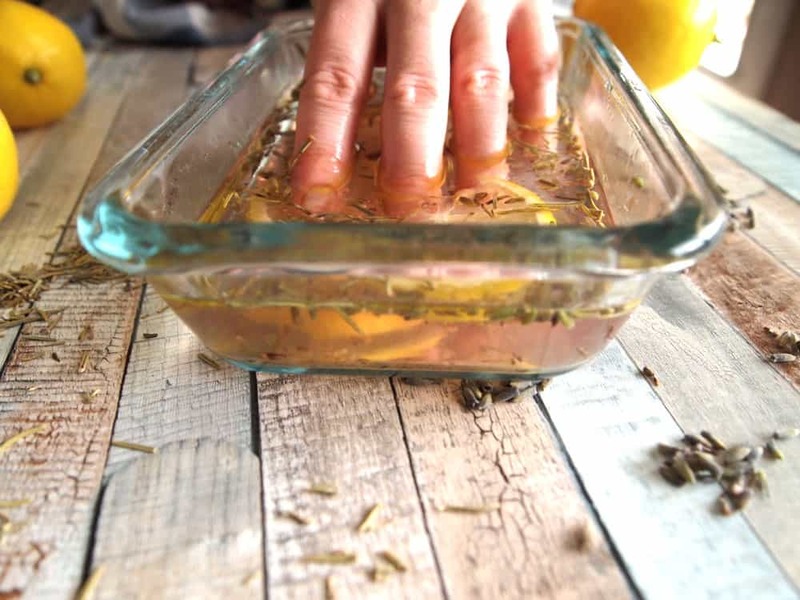 My herbal nail soak recipe uses lavender, rosemary, lemon and olive oil to strengthen nails and soften cuticles. WHY DO A NAIL SOAK? I have a confession – I love to do my nails. I am the worst at makeup and my hair is usually in a ponytail, but there is something about nicely painted fingers that feels like self-care to me. The problem is, most nail products are loaded with toxic ingredients. Nail polish and polish remover are some of the worst offenders on the toxic beauty products list (and are a large topic for another post – coming soon!). All of those toxins can wreak havoc on your nails. In addition, lots of salons are less than hygienic and slather toxin filled products all over. Nope, that’s not for me! So I have become pretty good at giving myself a DIY manicure. Anyone who paints their nails frequently knows what a toll all of the polish can take on your nails. Dry, brittle or broken finger nails are typically common for anyone who keeps their fingers polished. TIP: Using a great base coat helps keep nails strong. I love this base coat from Zoya. Zoya is my favorite polish brand because it is one of the cleanest brands I’ve found that actually works. 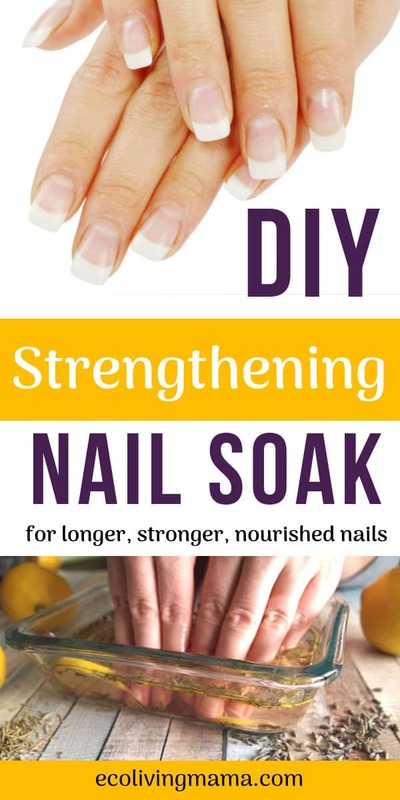 A simple DIY nail soak can work wonders to strengthen and lengthen nails. 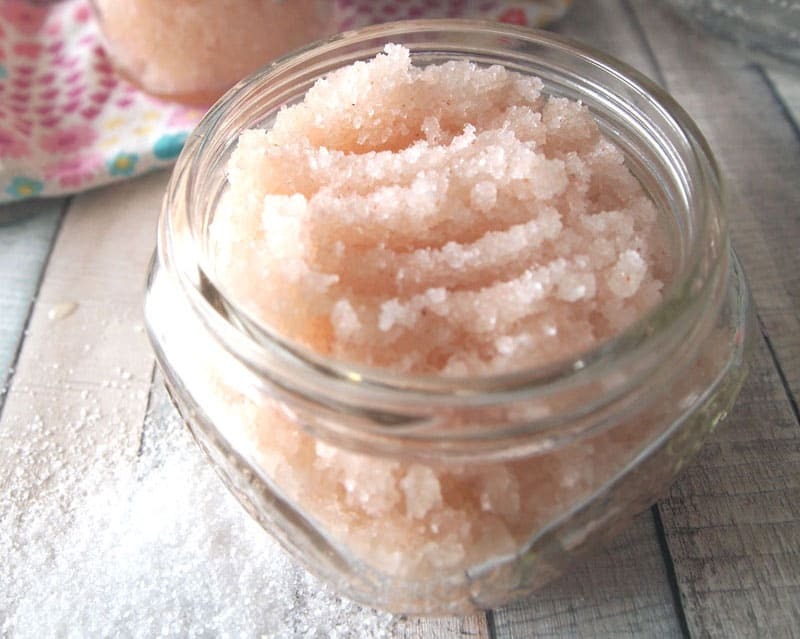 I’ve formulated my nail soak recipe with ingredients specifically for healthy, strong nails. I use ALL of these ingredients in my favorite cuticle oil recipe, and have heard nothing but rave reviews about it’s cuticle softening and nail strengthening powers. 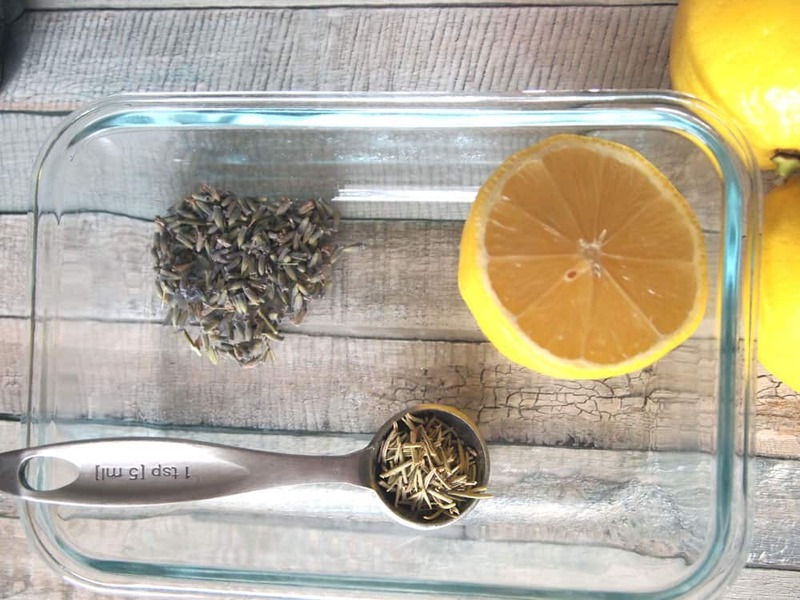 Here’s a breakdown of why this herbal nail soak with lavender, lemon and rosemary is exactly what your nails are craving. WHAT ARE THE BEST OILS FOR NAILS? Olive Oil is a great oil to strengthen nails. It is moisturizing, absorbs easily and is probably already in your kitchen. 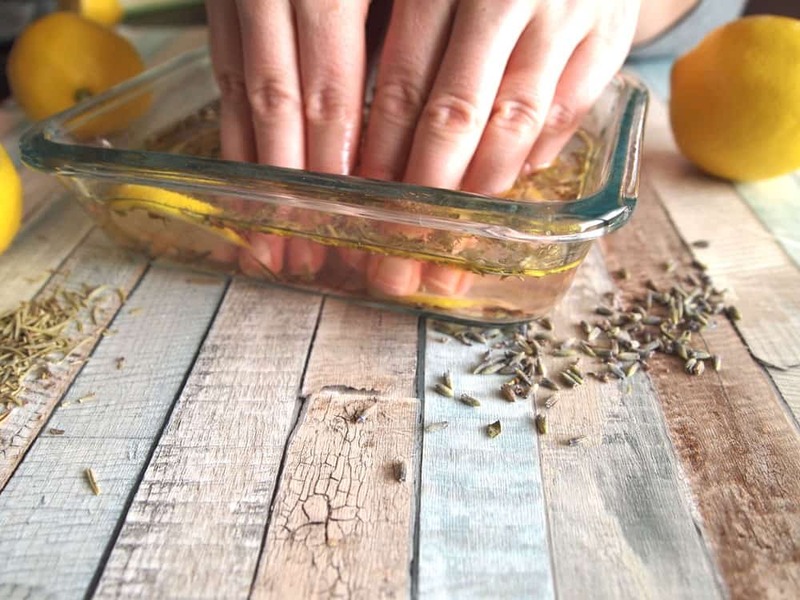 Because it is so accessible, I’ve used olive oil in this nail soak recipe. Jojoba oil is fabulous oil for all things skin and nails, and I almost used it in this recipe instead of olive oil. Jojoba oil is the closest to our skin’s own actual sebum, and nails soak it up – it is super nourishing. I think jojoba oil is one of the best oils for nails, but it can be expensive and more difficult to find. If you have it on hand, try it in this nail soak instead of olive oil for a super luxurious nail treatment! My 3 favorite herbs and essential oils for healthy, strong nails are lavender, lemon and rosemary. Lemon is antiseptic and can help whiten stained or discolored nails. 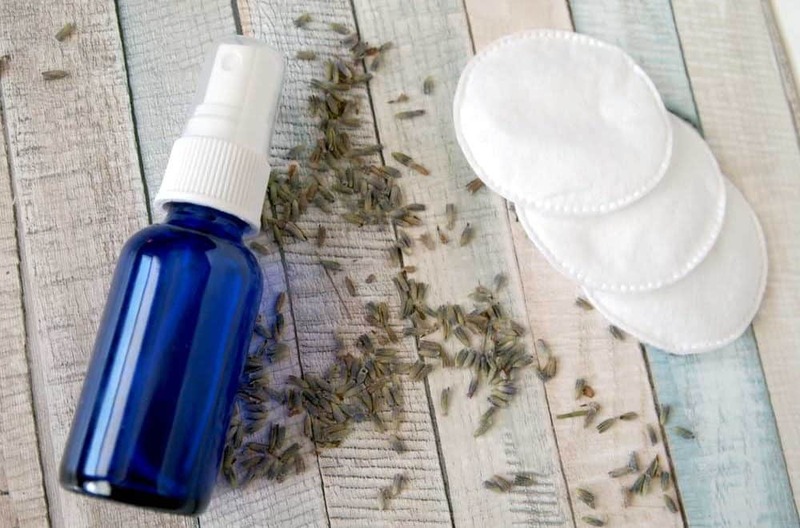 Lavender is great for all kinds of skin conditions, including cuts, inflammation and dry skin. Rosemary is another great herb to help strengthen nails and is also antiseptic. For the nail soak recipe, I’ve chosen to use herbs instead of essential oils. If you prefer to use essential oils you absolutely can with good results. 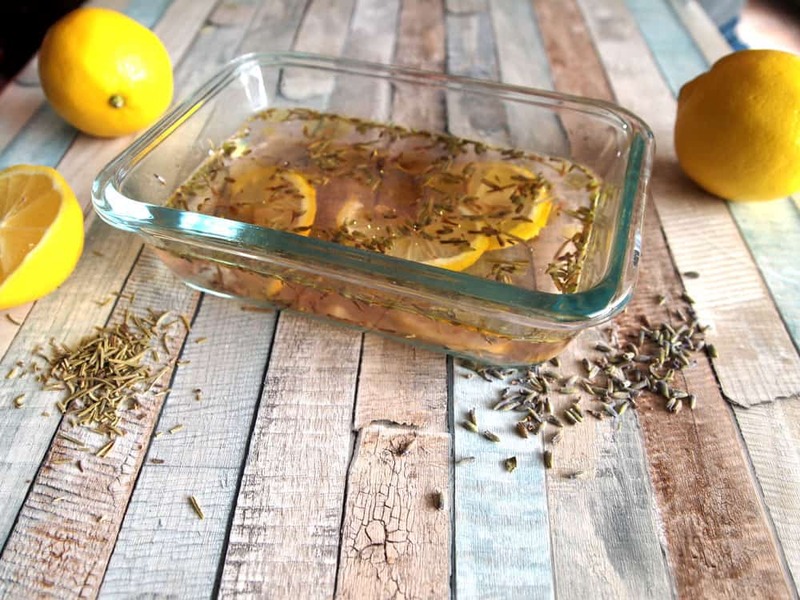 I recommend using 2 drops each of lavender, lemon and rosemary in place of the herbs and fresh lemon. 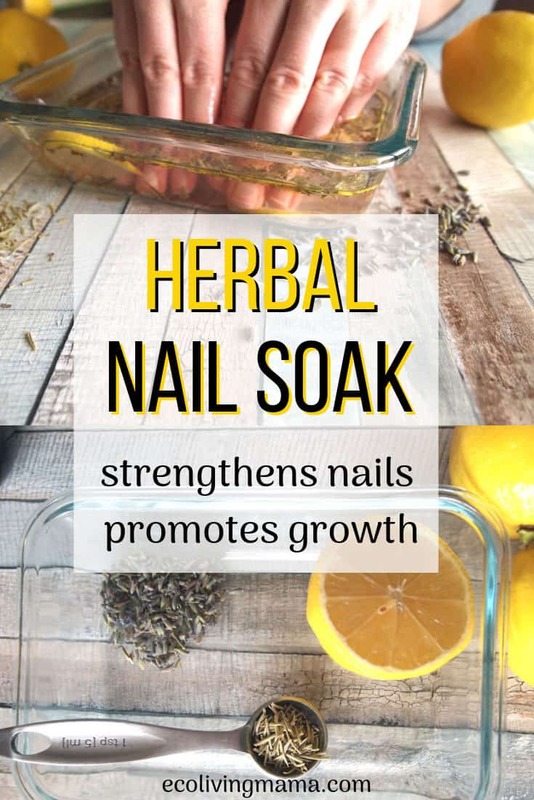 You can find all ingredients to make this herbal nail soak on this Amazon page. If you prefer to use essential oils in place of the herbs and fresh lemon, use 2 drops each of lavender, lemon and rosemary. I recently discovered this Vitamin E in a dropper bottle and I am ecstatic about it! I love, love, love adding vitamin E to my homemade skincare, and this is so much easier than ripping open capsules. If you’re into DIY beauty or skincare, you need this stat. (I’ve linked to a big bottle, I suggest pouring it into your own dropper bottle for easier use). And that’s it! 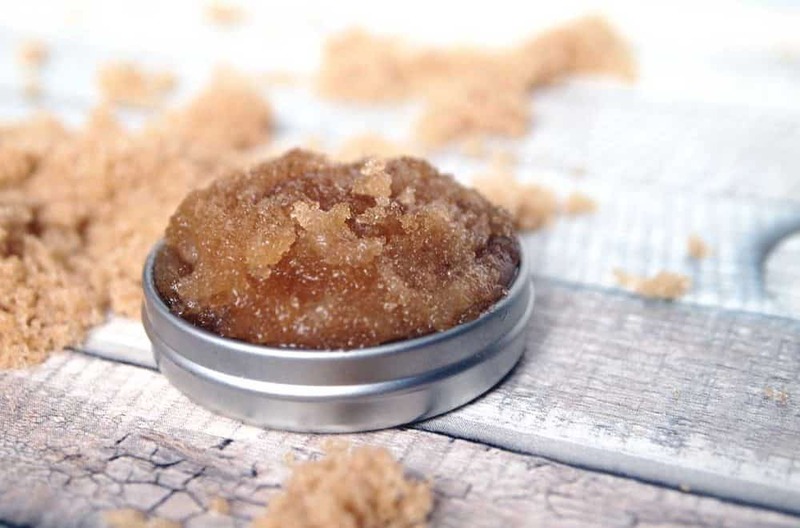 When you use natural ingredients, it is easy to bring life back into brittle, dry nails. Give it a try and let me know how it works for you! Hey! Have you ever tried Color Street nail strips? I was looking at your cuticle oil recipe and saw that you like to paint your nails but hate all the chemicals. Color Street is clean and easy! I’ll happily send you a set to try, or checkout my website. To make it clear, I’m not looking for any endorsements, just passing along info on a great product! I’ve never tried Color Street, but I used to use Jamberry quite a bit. I couldn’t get a great fit on my nails though, so didn’t love them. But they were definitely cute.